Forget heavy crockpot recipes made with condensed soups. 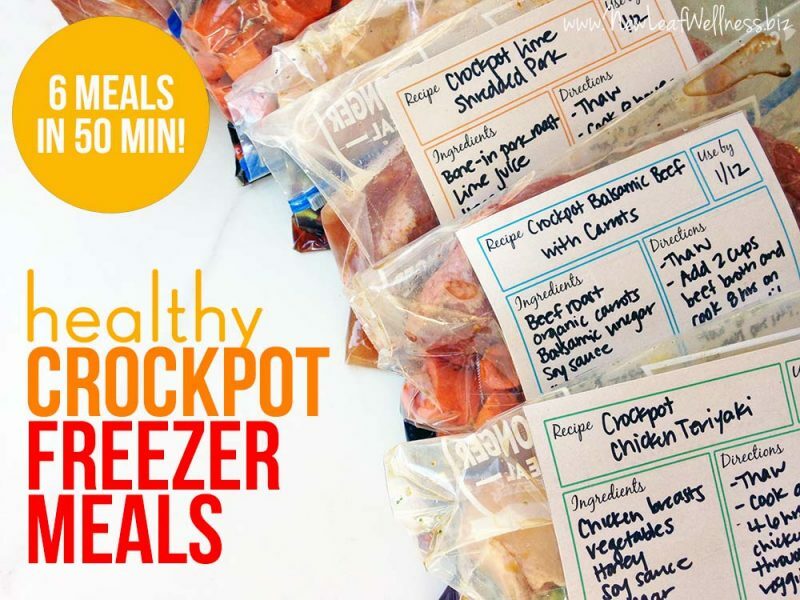 My healthy freezer crockpot meals are made with meat, real food, and vegetables. Here’s how you can prep six meals in 50 minutes, including my recipes, grocery list, and most helpful tips. 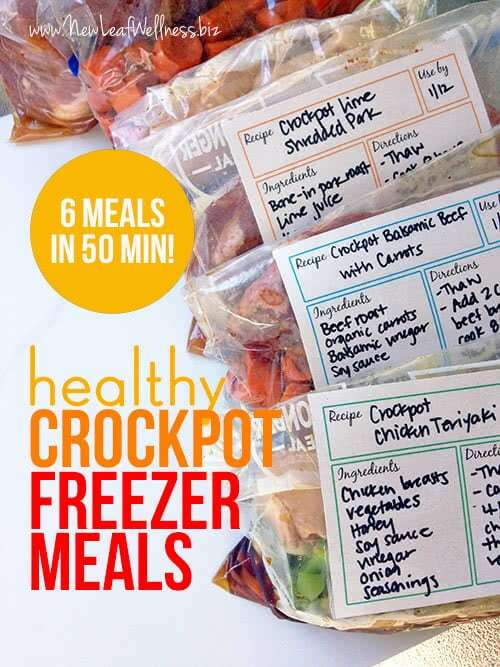 I prepped six healthy crockpot freezer meals last week and they were so easy to make. None of the recipes required any cooking ahead of time so I was able to prep all six in 50 minutes time (including clean-up!). In my six freezer meals in 30 minutes post, I explained why I always double my freezer meals. Basically, making two of each meal saves money and time and we always look forward to eating the same meal twice. Plus, I love having extra meals on-hand to give to family and friends. I’ll tell you that we already tried all of the recipes and they’re delicious! I bought the ingredients from Aldi and another local grocery store for a total of $73.45. I bought organic ingredients and didn’t find any great sales or coupons. 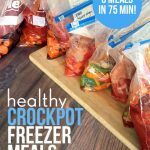 What’s so great about these freezer crockpot meals? I was able to prep all six meals in 50 minutes. 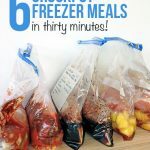 I froze all of my meals raw so they were very easy and quick to make. Plus, they’ll cook for the first time in my crockpot and won’t taste like leftovers at all. Wahoo! I grocery shop ahead of time. I print my recipes so I don’t have to search for them on my phone/tablet/computer. On my prep day, I label my freezer bags and get out all of the necessary ingredients. I chop all of the fresh vegetables and then work in an assembly line to fill all of the freezer bags. 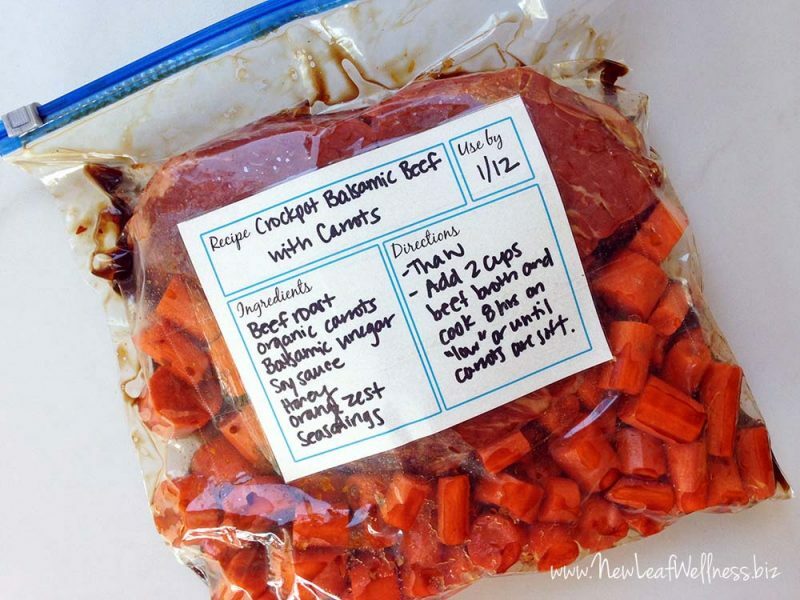 Seal, lay flat in the freezer, and store for up to 3 months. Easy-peasy! 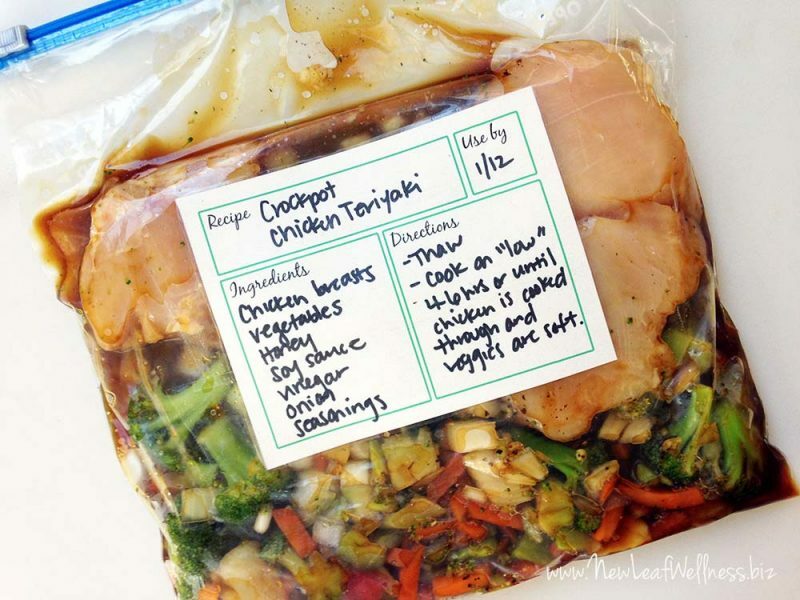 When we’re ready to eat, I thaw the meal in the refrigerator overnight and then let the crockpot do all the work. (If I forget to thaw overnight, I thaw the freezer bag in cold water.) 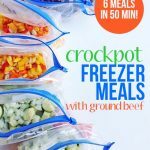 If you’re new to freezer cooking, my crockpot freezer eBooks also contain a lot of great recipes and tips. Questions or comments? Leave a comment below. I’d love to hear from you! P.S. I’m considering doing a future freezer cooking session with ingredients from only one store (For example, Costco, Trader Joe’s, or Whole Foods) Thoughts?? Awesome! These all look delicious! Definitely trying them all. Now that I am “empty nested”, it’s hard to get motivated to cooking everyday….so I LOVE the idea of cooking ONE day and having nutritional, tasty meals to enjoy each day. Thank you!! Yes! Yes!!! Joe’s ingredients would be awesome!! Noted! Thanks for the input. The recipes look relish! I like your idea of doing a store specific shopping/freezer meal post, but not everyone has a Costco, Aldi, Whole Foods, or Trader Joes near them. That’s my only concern. I meant to say delish not relish lol,gutta love auto correct! Lol, I totally read it was delish! Thank you, Ashley! They’re in my No Cook Freezer Meals cookbook. I also sell them as a separate download for .99 cents. I saw some comments about mushy vegetables. Should I not put the vegetables in at the beginning? Amy, it’s a personal preference. If I’m going to be home while a meal is cooking, I sometimes throw my vegetables in later for added crunch. Hi! This link does not work anymore. Do you have a new one? Thank you! 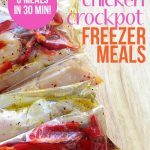 You had me at “crockpot freezer meals!” These look so yummy! I’m especially tempted by the Terriyaki Chicken recipe. I keep trying to find a recipe that tastes like the stuff you can find at Japanese hibachis. I love that and would love to find a cheap alternative to going out to eat. I also love your labels. What a great idea. Did you make those up yourself? How do you get them to stick to a frozen bag? Thanks for sharing all these great idea. I’m going to have to add these recipes to my shopping list. Thank you, Kim! I designed the labels for my No Cook Freezer Meals cookbook. I print them on regular computer paper and attach to the bags with clear shipping tape. I especially love using them on meals for friends! I wish there were amounts of each ingredient on them. If you open the printable pdf, all of the recipes are listed in full. Ready for some new & healthy freezer meal recipes. Thanks for posting. Thank you for your encouragement, Janene! Do you cut the chicken into pieces or leave them whole? The recipes look great! I did about 8 chicken ones last month and it has been so nice to pull supper out of the freezer every few days. Leave them whole. I think prepping freezer meals is so much easier than cooking!